vintage photo - what type of camera is this (photographer mirror reflection)?? Discussion in 'Other Systems' started by krugorg, Oct 18, 2011. My Mom scanned a bunch of her family's old photos. 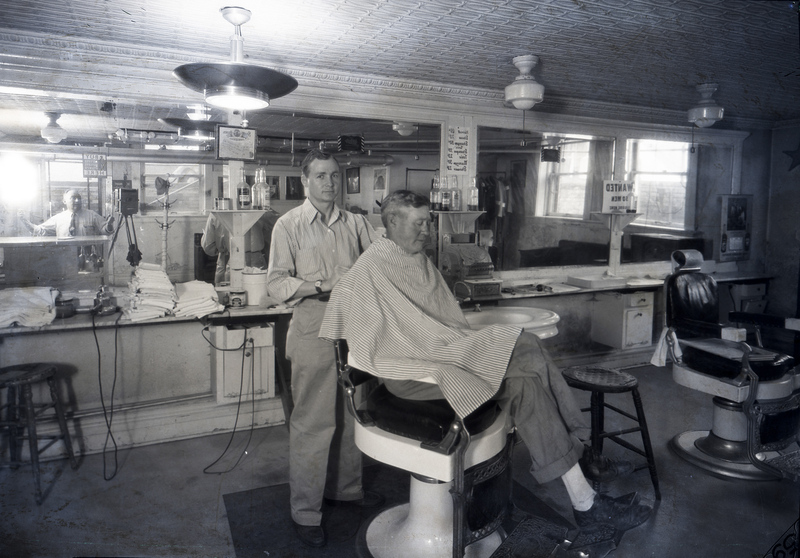 I ran across the following image, which is a portrait of my grandfather in his barber shop in the late 1940s. I thought it was interesting that you could see the photographer in the large barbershop mirrors. Assume he was going to crop this down for a newspaper article or advertisement and wasn't worried about his reflection. Anyone have any idea on the camera used here? It was a small, rural, but fairly prosperous Midwest US town, so it may not have been bleeding edge photographic technology! The camera did strike me as looking old school even for the time period (1948-50ish)? Looks like an old 4x5 ... don't know specifics. What is odd is that this photo was printed wrong (emulsion side up) or the photographer chose to shoot into the mirror because all the lettering is reversed. Back in the 40's-50's, 4x5 was a fairly common format. Even some newspapers used handheld 4x5 format cameras, but most had changed to 120mm (2.25x2.25) format and shot with twin-lens reflex cameras. if only the lotto would smile on me ! Thanks for the information, guys. Interesting stuff! Trying to remember the tiny bit of printing I did for the school paper, but is there a reason it would be printed that way as a proof before actual newspaper printing? Those modern classics are super cool. I think there is a parallel there between these and modern, high-end turntables. A whole lot of money for the last couple %'s of improvement, versus the relatively inexpensive digital sources. of their ability to take film of all formats, inc digital. Any lens becomes a shift lens. and with the correct lens movement you can achieve unlimited depth of field . This is super handy as the bigger the format the smaller the DOF. They are truly Great pieces of photographic kit, and i feel lucky to have been taught how to use them. Having worked for newspapers from the 60's to 80's ... we always printed so you could read the writing ... emulsion side down. It may have been printed reversed because it looks better. A common practice even now. As you well know Its not difficult to see what side the emulsion is on on a very large negative. As the exposure of the print is pretty good, (I would have given a little more contrast) It does show skill on the part of the printer. I would like to believe the reverse print was intended.